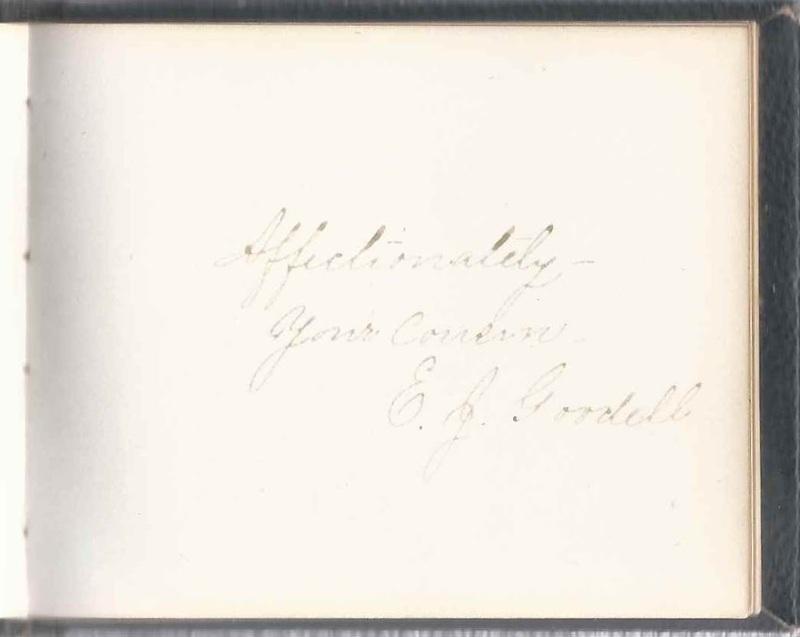 1867-1872 autograph album that I believe belonged either to Lucinda Smith or her brother Charles of Saxtons River, Vermont, the children of Benjamin and Lucinda (Goodell) Smith. 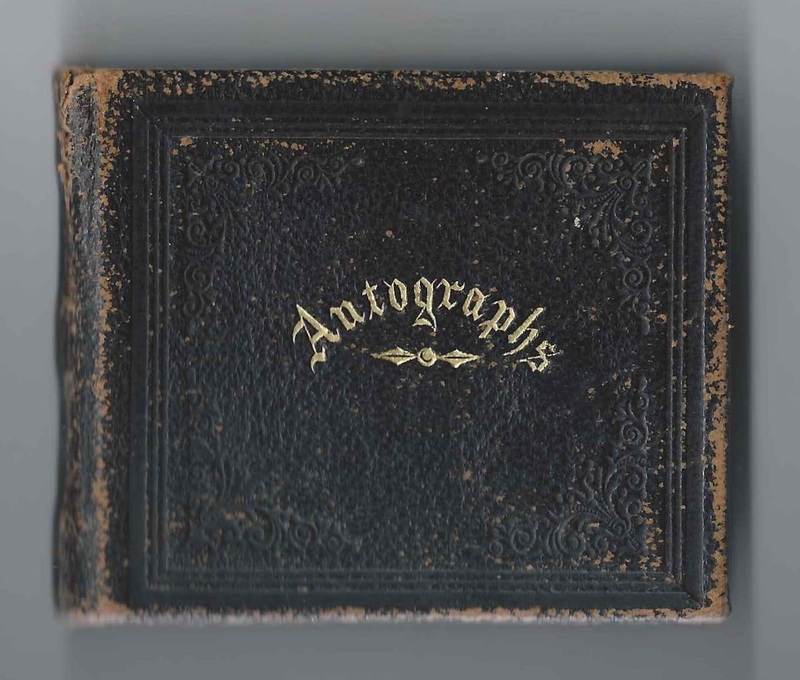 The album features autographs from Vermont and from the Yarmouth, Massachusetts, area. Unless I've missed a sibling, which is possible, I believe the album belonged to either of the two above, based on process of elimination, as other siblings signed in the album or had passed away. Benjamin Smith was married before and had children from that marriage as well, but one signer in the album, E. J. Goodell, indicated a cousin relationship with the album owner, apparently through Lucinda (Goodell) Smith, so I believe the owner was a child of Benjamin's second marriage to Lucinda. The album is a small one, measuring approximately 3-1/2" x 2-3/4", but it's rather thick in relation to its linear dimensions. The album contains the sentiments of 29 of the owner's relatives and friends. An alphabetical surname list and an alphabetical list of the signers, together with any personal information they offered, appear at the end of this post. Benjamin Smith had passed away by the time the album came into use. He was born 28 January 1778 at Westminster, Vermont, son of Benjamin and Sarah (Paul) Smith. His first marriage, on 12 February 1801, was to Mehitable Clark of Harwich, Massachusetts. She may be the link to the autographs of the Massachusetts signers. Benjamin and Mehitable had six or seven children, among them Phoebe Ann, who married Benjamin Frost. Phoebe, her husband Benjamin, or perhaps their son of the same name, and two other of her children signed pages in the album. There may have been other children or descendants of Mehitable (Clark) Smith who signed pages in the album. Mehitable (Clark) Smith died in 1814. On 4 November 1817 in Windham County, Vermont, Benjamin married Lucinda Goodell, daughter of Asahel and Mary (Hitchcock) Goodell. Lucinda signed a page in the album in October 1872. Elizabeth Smith, born 21 November 1818 at Rockingham, Vermont. She would marry Nathan Hall. Charles Smith, born 29 May 1825 at Rockingham, Vermont; married Susan L. Wiswell and Elizabeth A. Jones; died 23 March 1885 at Washington, D.C.
Of the five siblings living in the era of the album, three of them signed pages in the album. Elizabeth (Smith) Hall and her daughter Jennie E. Hall of Grafton, Vermont, signed pages, Elizabeth on January 31, 1869 and Jennie on February 18, with no year written. 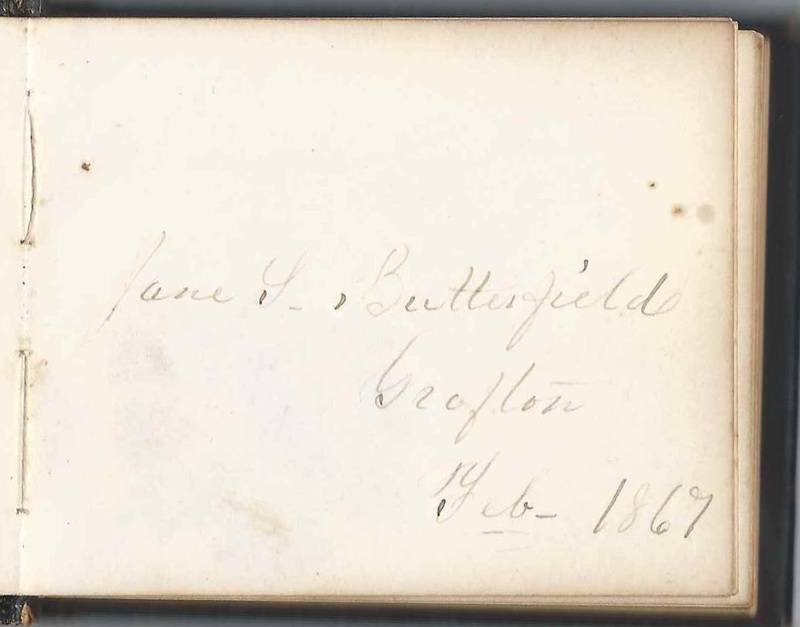 Jane M. (Smith) Butterfield and her husband James Lewis Butterfield of Grafton, Vermont, signed pages, Jane in February 1867. Fannie Hall (Smith) Bancroft and her husband James Kimball Bancroft shared a page on January 22, 1871, and Fannie signed another page, also in January 1871. Two siblings did not sign, and it's likely that the album belonged to either one of them, Lucinda Smith or Charles Smith. Other signers in the album had a family relationship as well, as you can see in the list of signers below. If you have corrections and/or additions or information on any of the other signers, please leave a comment or contact me directly. Thanks! Matie of Providence, Rhode Island, signed on October 30, 1867. Perhaps Mason Kimball, son of signers David and Annie E. Kimball. F. H. S. Bancroft of Saxtons River, Vermont, signed in January 1871; Fannie Hall (Smith) Bancroft, wife of James K. Bancroft. "your aff. sister". She signed another page with her husband. Sister of the album owner, who was, I believe, Lucinda Smith (1823-1884) or Charles Smith (1825-1885). J. K. Bancroft and F. S. Bancroft, signed at Saxtons River, Vermont, on January 22, 1871. James Kimball Bancroft and Fannie (Smith) Bancroft, a sister of Lucinda Smith (1823-1884) and Charles Smith (1825-1885), either of whom, by process of elimination, may have been the album owner. Jane S. Butterfield of Grafton, Vermont; signed in February 1867. Jane was Jane (Smith) Butterfield, daughter of Benjamin and Lucinda (Goodell) Smith and a sister to the album owner, who was, I believe, Lucinda Smith (1823-1884) or Charles Smith (1825-1885). F. G. Butterfield, signed in April 1867 at S.R.V., presumably Saxtons River, Vermont. He was Franklin G. Butterfield, who shared the page with wife Maria Smith (Frost) Butterfield. Maria S. F. Butterfield, signed in April 1867 at S.R.V., presumably Saxtons River, Vermont. Maria Smith (Frost) Butterfield, who shared the page with her husband Franklin G. Butterfield. Maria was a granddaughter of Benjamin Smith and his first wife Mehitabel (Clark) Smith, through their daughter Phoebe Ann (Smith) Frost. Amanda P. Cotton of South Yarmouth, Massachusetts, signed on October 14, 1867; daughter of Sylvanus Parker Cotton and Lydia (White) Cotton Howes, wife of signer Zenas Howes. Charles S. Frost of Saxtons River, Vermont, signed in April 1867. Son of signers Benjamin and Phoebe Ann (Smith) Frost. Henry S. Frost, signed in 1867. Son of signers Benjamin and Phoebe Ann (Smith) Frost of Saxtons River, Vermont. P. A. S. Frost, signed on April 14, 1867. Presumably Phoebe Ann (Smith) Frost, daughter of Benjamin Smith and his first wife Mehitabel (Clark) Frost. Benjamin Frost, signed on June 3, 1867. Presumably the husband of signer Phoebe Ann (Smith) Frost or their son of the same name. E. J. Goodell; "your cousin". Presumably Eliza Jane Goodell, daughter of Joseph Goodell, a brother to the album owner's mother Lucinda (Goodell) Smith, and Cynthia (Hitchcock) Goodell. Lucinda (Goodell) Smith was the mother of the album owner, either Lucinda Smith or Charles Smith, by process of elimination. E. S. Hall, signed on January 31, 1869; presumably Elizabeth (Smith) Hall, wife of Nathan Hall; daughter of Benjamin and Lucinda (Goodell) Smith; and sister of the album owner, who was, I believe, Lucinda Smith (1823-1884) or Charles Smith (1825-1885). 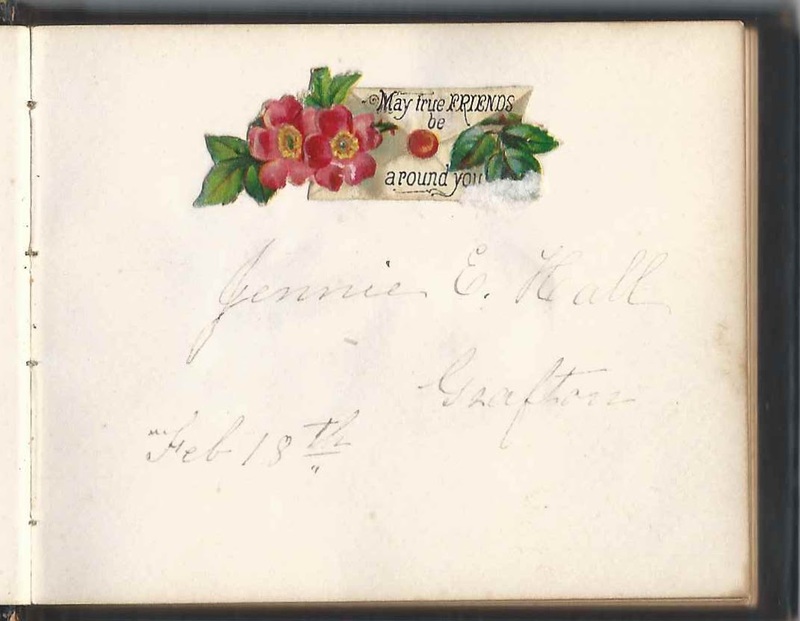 Jennie E. Hall of Grafton, signed on February 18 [no year written]. Perhaps daughter of Nathan H. Hall and wife Elizabeth (Smith) Hall. Elizabeth was a sister of the album owner, either Lucinda Smith (1823-1884) or Charles Smith (1825-1885). H. Harris, M.D., of South Yarmouth, Massachusetts. He was Handy Harris, M.D., whose wife Experience (Davis) Harris also signed a page in the album. E. D. Harris of South Yarmouth, Massachusetts, signed on October 13, 1867. Presumably Experience (Davis) Harris, wife of signer Handy Harris, M.D. Zenas P. Howes of South Yarmouth, Massachusetts, signed on October 18, 1867. Zenas Parker Howes, son of signers Zenas Howes and third wife Lydia (White) Cotton Howes. Sylvia M. Howes of South Yarmouth, Massachusetts, signed on October 18, 1867. Daughter of signer Zenas Howes and his deceased second wife Martha (Howes) Howes. Zenas Howes of South Yarmouth, Massachusetts, signed on October 18, 1867. His third wife Lydia (White) Cotton Howes signed a page, as did two of his children. Lydia C. Howes of South Yarmouth, Massachusetts, signed on October 18, 1867. She was Lydia (White) Cotton Howes, whose husband Zenas Howes signed a page in the album, as did her daughter Amanda P. Cotton from her marriage to Sylvanus Parker Cotton; her son Zenas Parker Howes with Zenas Howes and Zenas' daughter Sylvia Maria Howes from his second marriage to Martha (Howes) Howes. D. Kimball of Providence, Rhode Island, signed on October 30, 1867. Presumably Vermont native David Kimball and his wife Annie E. Kimball, with whom he shared the page. The "Matie" of Providence, Rhode Island, who signed a page may have been his son Mason Kimball. A. E. Kimball of Providence, Rhode Island, signed on October 30, 1867. She was Annie E. Kimball, who shared the page with her husband David Kimball. The "Matie" of Providence, Rhode Island, who signed a page may have been their son Mason Kimball. 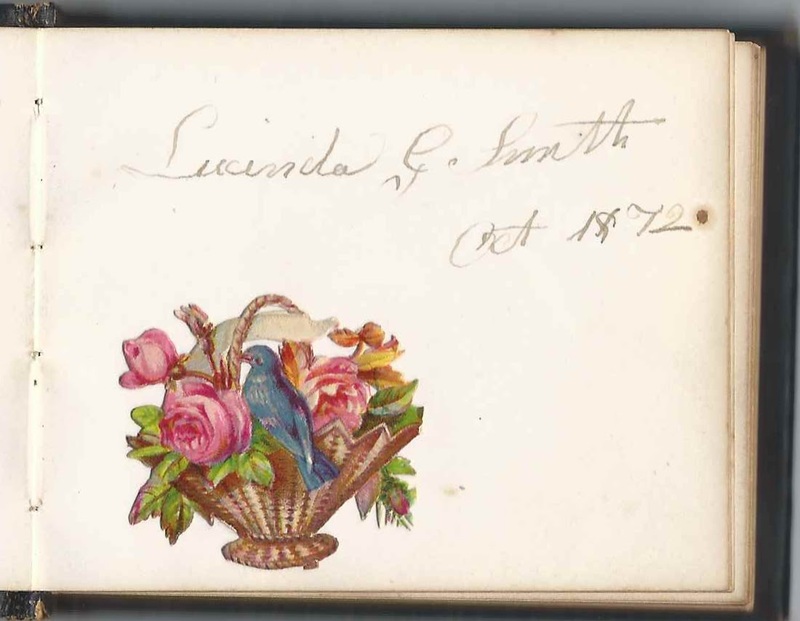 Lucinda G. Smith, signed in October 1872; Lucinda (Goodell) Smith, widow of Benjamin Smith and mother of the album owner, who was, I believe, Lucinda Smith (1823-1884) or Charles Smith (1825-1885).